A fresh leak has given us an idea of the sort of performance we might expect from Intel’s Core i7-9750H laptop-targeted processor, as well as the notebook spin on Nvidia’s allegedly imminent GeForce GTX 1650 graphics card. This comes from @momomo_us on Twitter (a source of a number of previous leaks), who did some digging and unearthed promotional material for a supposedly incoming gaming laptop from MSI, which uses both the aforementioned components. On the processor front, the leaked figures highlight an undetermined benchmark from MSI which shows that the Core i7-9750H is around 28% faster than the i7-8750H it replaces – plus it’s roughly twice as quick as the i7-7700HQ. In other words, it’s a bit of a notebook speed demon, with a near-30% jump being an impressive upgrade compared to its predecessor. That said, we must firstly bear in mind that this is only a purported leak, and also, there’s the fact that we don’t know what benchmark MSI used here. With the graphics card, which is Nvidia’s GeForce GTX 1650 that we’ve been hearing so much about recently – rumored to be launching later this month – we do at least know that the benchmark is 3DMark 11, and it shows the mobile GPU hitting a score of 11,294. That compares to a result of 7,979 for the GTX 1050, so a quick bit of maths indicates that the GTX 1650 will be a very tidy 41% faster. The GTX 1050 Ti scored 9,114, and so the GTX 1650 will (allegedly) be around 24% faster. Again, that’s impressively nippy, and MSI’s promo bumph also shows that the GTX 1650 has 4GB of video memory and a base clock of 1,395MHz, reinforcing previous speculation that those specs are on the money. Furthermore, some gaming frame rates are also quoted, including the laptop (and therefore the GTX 1650) hitting 98 frames per second (fps) in Fortnite, 75 fps in GTA V, and 65 fps in PUBG, presumably at Full HD resolution (as that’s the spec of the 15.6-inch IPS display). 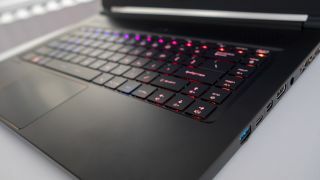 The MSI laptop which the leaked details pertain to is the GL63 for 2019, the top-spec model of which will have the aforementioned CPU and GPU, backed with 16GB of system memory and a 512GB NVMe SSD. The lesser variant keeps all the above, but switches the processor for a Core i5-9300H.